Abstract: Antibodies represent central tools in most biological studies to analyze protein localization and function. One of the remaining limitations is the challenge to make them work inside a living cell. For this purpose intrabodies can be selected as powerful tools to answer complex biological questions, like for example conformational intrabody recognizing specifically the GTP-bound form of the small GTPase Rab6. So far, the access to intrabodies was limited to highly trained lab specialists. 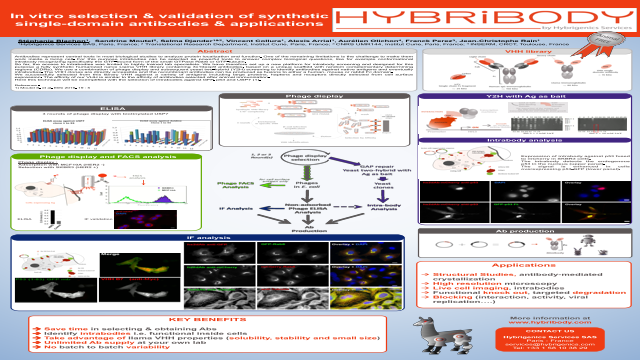 We have therefore set up a new platform for intrabody screening and designed for this purpose a fully synthetic humanized naïve Llama VHH library containing 3x10exp9 antibodies, based on a unique scaffold with random complementary determining regions (CDRs). We use a combination of phage display and subsequent yeast two-hybrid (Y2H) screening to identify antibodies against native antigens and eventually intrabodies. The VHH clones are directly accessible and the recombinant antibodies can be produced as fusions to either a human, mouse or rabbit Fc domain. We successfully selected from this library VHH against a variety of antigens some of which will be exemplified, like intrabodies against GFP, p53 and USP7 (1). The affinity of our VHH is similar to the affinity of antibodies selected after animal immunization.